Hey, guys! I just posted a new PDF over at my Gumroad and Lulu shops. This story takes place one month after Gorilla George Brogan defeated Alexi Volkov and became the World Heavyweight Champion. The former champion just hasn't been the same since. And nobody has noticed this more than Alexi's lover, the American wrestler Ryan Dermot -- known also by his wrestler name: the Colorado Cowboy. Alexi has been out of the limelight for the month since his defeat, preferring to keep himself in his and Ryan's private gym to work out. 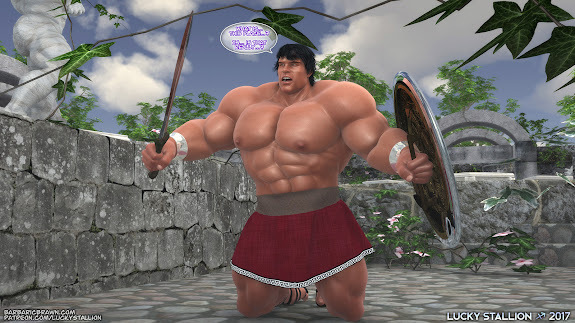 Even in their full-sized private wrestling ring, Ryan defeated his lover seven out of the seven times they privately wrestled since Alexi's defeat. But the most jarring change was in the blond Russian's sexual appetites. He would frequently raise his backside for Ryan, when before, he was nothing but a total top. Check out the previews over at my Comics Blog here, or you can use the links below to buy yourself a copy! Thanks very much; I appreciate your support greatly! This set is a sort-of sequel to one I made back in 2013. It's a cold winter night in the Batcave, and the Caped Crusader is waiting for his favorite opponent, the Stud of Steel, to descend into his private wrestling arena for some sensual grappling and more. This story is a work of parody; characters and names are (C) DC Comics. »» Need to catch up on Part 1 first? Click here to go back to it! Returning for this pro wrestling championship match are my Brazilian Bodyslammer twins, Gabriel and Fabio! Challenging the Bodyslammers for control of the World Middleweight Tag Team title and belts are returning wrestler from Japan, Natsu Ken, and newcomer from Mexico, Victor "Mr. Dreamboat" Ortiz. 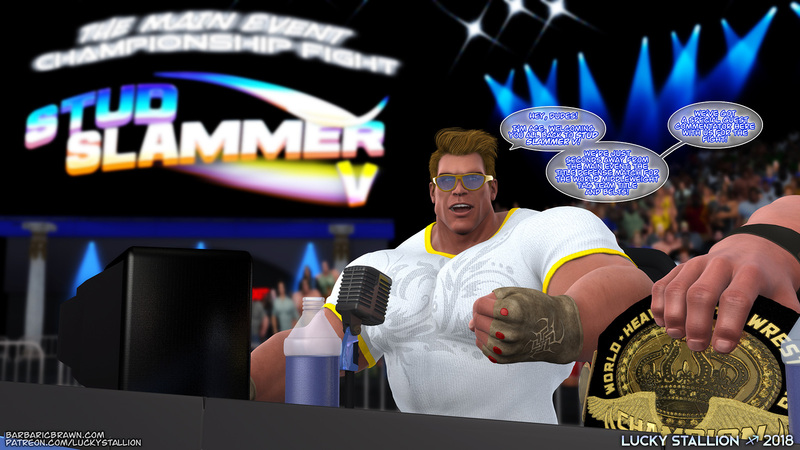 This match features a special guest co-commentator, Gorilla George Brogan, the current World Heavyweight Champion! In my more recent works (currently only over at my Patreon,) I've changed over using to a new font and style for my dialog. To make things easier for you guys who have difficulty reading the older style, I'll be adding captions to the images below that have dialog. Thanks! This image set is 57 panels total and will be split into two posts here. Enjoy, guys! 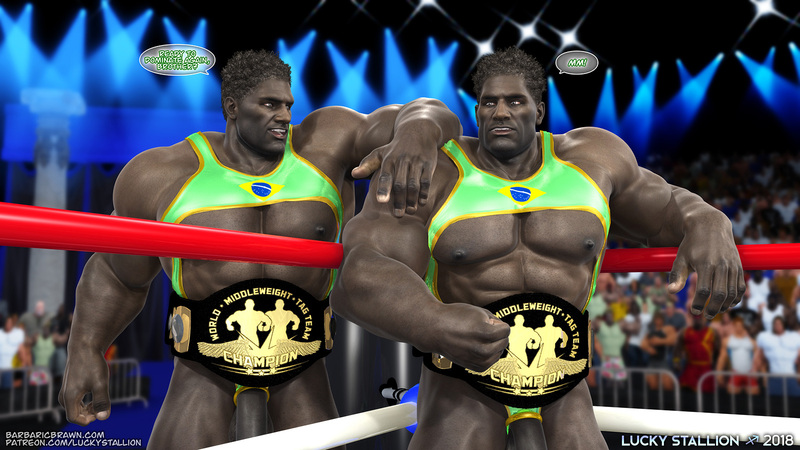 Fabio: "Gabriel and I are the tag team champs! You two are nothing!" Gabriel: "Ha ha! Be a good boy and hold still." Ace: "Hey, dudes! I'm Ace, welcoming you all back to Stud Slammer V! We're just seconds away from the Main Event: the title defense match for the World Middleweight Tag Team title and belts! 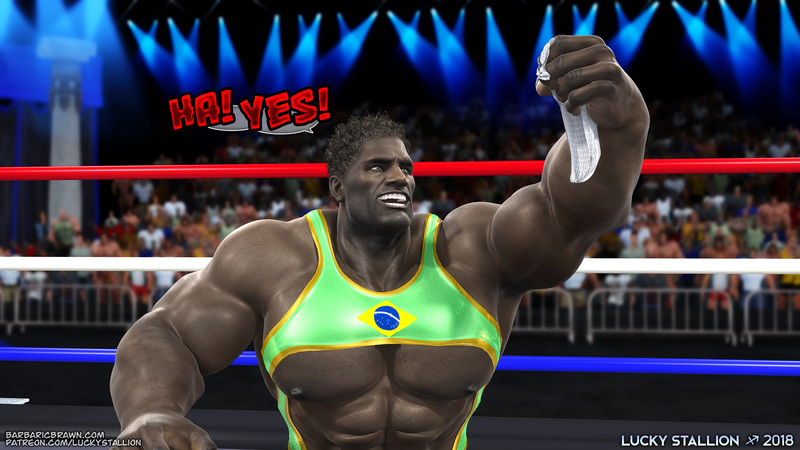 We've got a special guest commentator here with us for the fight!" Gorilla: "Thanks, Ace! Bonzer bein' behind the table for this match! I'm familiar with the midweight champs -- saw them wrestlin' Alexi and Ryan once, and I gotta say: the challengers today have got to bring their best to this ring!" Connor: "Welcome to the Main Event! In the blue corner, from Rio de Janeiro, Brazil... the World Middleweight Tag Team Pro Wrestling Champions... Fabio and Gabriel, the Brazilian Bodyslammers!" Fabio: "Ready to dominate again, brother?" Connor: "From Cancun, Mexico and Nagoya, Japan... challenging the champs for their belts... Victor 'Mr. Dreamboat' Ortiz and Natsu Ken!!" This story is an alternate outcome of the original fight here. Jabari, king of the jungle, faces off against Zeus, king of the gods, in this quick crossover match where superpowers (among other things) are stripped and all that is left to rely on is muscle and might. This is Hard as Stone, an Olympian tale with two new characters: Joran, a mortal human sent to defeat the fiendish Heluon, who has been turning gods to stone and stealing their powers for his own! 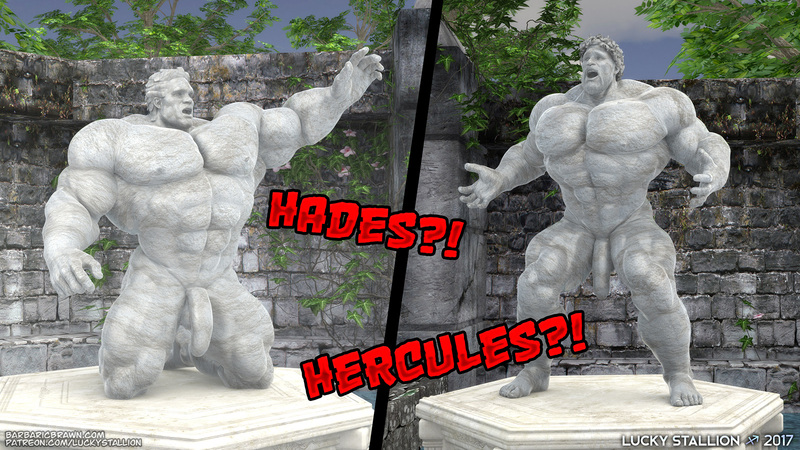 The male gorgon has his eyes set on the king stud god Zeus next! I intend to do an alternate ending to this one in the future, so please keep a lookout for it!